Trump supporters talk to Anderson Cooper. How do we break these chains of oppression? For so many years as a woman I have tried to breathe without making a sound. I have tried to go unnoticed, because as a woman, that’s the best possible outcome: To walk down the street without being seen. To avoid raising the ire of your bosses by standing up for yourself. To wear something your mother deems appropriate enough not to comment upon. To not look fat. Hillary Clinton is like me, but she is also a different type of woman. One who declared her ambition and went boldly toward her goals, who dared to forget her status as subordinate. A woman who thought about power and control. A woman who declared herself best for the job of President of the United States without hesitation. A stark reminder was delivered Tuesday night. Educated women of the world, ambitious women of the world, daring women of the world: know your place. This message was delivered primarily by white voters, according to exit polls. Around 63 percent of white men voted for Trump. However, to the surprise of many, 53 percent of white women also supported the candidate, despite his notoriety as a misogynist. So today, in addition to reading truly harrowing Facebook posts from LGBT parents, biracial families and terrified women of all races, there is a call to blame that group from which Hillary Clinton herself hails: white women. Many wonder why more white women didn’t stand up to Trump, a candidate who openly stated he would like to grab women by their genitalia. People wonder why black women and Latina women were able to send Trump a stronger message of disdain. While exit polls find 94 percent of black women and 68 percent of Latina women voted for Clinton, across the board, women from all surveyed demographics were on the whole nearly as likely to support Trump as their male counterparts. For example, 13 percent of black men voted for Trump compared with 4 percent of black women, according to CNN. Among Latino men, 33 percent voted for Trump compared with 26 percent of Latinas. White women were reportedly 10 percent less likely to support Trump than white men, marking the largest deviation between women and men in any group surveyed. Women on the whole did favor Hillary Clinton, so why did so many white women not take more of a stand against a Trump presidency? Why did they not vote against a man who denigrates women regularly, calling them fat, ugly or unattractive? It's because electing Trump was as much a decision made by white women as it was made by the internalized and outward misogyny that shapes us all. It was made by women who look in the mirror and see themselves as the person Donald Trump describes, just needing to lose a few more pounds before being a 10. It was made by men who see women as shiny accessories or property to be owned. To walk through life as a woman, with the full knowledge of what that means is exceedingly painful. White women in particular, who may have access to power through the white men in their lives, may in fact come to identify with the struggles of white men above their own particular struggles, because in many ways it's easier to take a stand for someone else than to reckon with the true feelings your culture has about you. Women went into voting booths and excelled at what our culture tells us to do: ignore our own needs. Stand up for white men, fight for them, live through them, make excuses for them, put ourselves in harm’s way for their benefit. So while it might be tempting to blame white women for the outcome of this election, let’s not. Doing so reinforces the idea that women have to be twice as responsible as men, not just 10 percent more. Furthermore, the cultural impulse to blame women is tragically aligned with the impulse that we as women have to blame ourselves. We blame ourselves for not getting a promotion despite evidence of a wage gap. We blame ourselves for failing to assert our needs or being “too much” in romantic relationships. We blame ourselves for the failures of children we could have raised better. Lastly, we blame ourselves for being unable to fix all the broken parts of ourselves that blame ourselves to begin with. Then, when we are done with that, we blame other women. 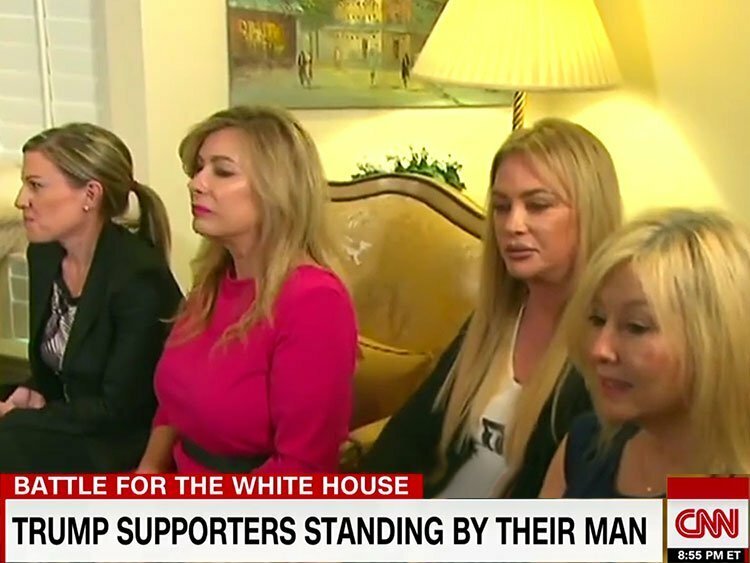 In 1973, the term Stockholm Syndrome was coined, defined as “feelings of trust or affection felt in certain cases of kidnapping or hostage-taking by a victim toward a captor.” In America today, upon learning the results of this election, many women, even the most aware among us, have come to realize once again just how complicit some of us are in our own captivity. We are held hostage, but our captor is not Donald Trump or any single individual. In this case we are held hostage by the patriarchy and our own internalized misogyny, still unable to break free.